Mile 1191, Chandler, AZ - A 2o miler wasn't planned for this close to the marathon. 14 days away and I wanted to be tapering. But, I also wanted to get in at least one 20 miler before I ran my first marathon. So, today's plan was to go to church for the 8 am service and pick up my kids. They were doing a Rock-a-thon all night to raise money for their youth mission trip to N'awlins this summer. 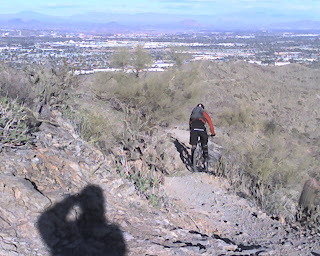 Then get in 20 miles before Amy and I went up to Scottsdale to a party at our friends house. This is a picture at the 2.5 mile mark. At this point I passed Citation drive and was running like a stallion. I later passed Secretariat drive too. 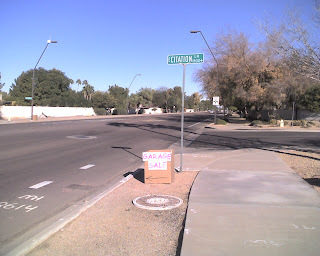 South Tempe has lots of triple crown race names for streets. I was feeling pretty good. I had cola flavored NUUN in my drink bottle and lots of GUs. At 3.5 miles I get to the canal. Right before the canal I was running up to an older lady. She wasn't dressed to run and had her purse on her left shoulder. When I got to about 20 yards behind her, she started running. She never looked back at me and was running at a pretty good clip. Finally, she couldn't run anymore. I got to about 10 yards behind her and she looked back a bit. I said, "hi, nice morning". I think she felt relieved that I wasn't a purse thief (she did change shoulders and seemed to protect the purse still) or worse. She even said hi back. I kept running and turned onto the canal. I ran east on the canal for a mile and then turned around to head toward Ken McDonald Golf Course. The temps were mid 50's and I wore sweat pants and a zippered sweat top over my running shirt. I looked like Bill Clinton out for a Presidential jog. More on that later. I get to run past the golf course twice. Going north I run from a blind spot right in front of a tee box. A dangerous proposition, if there are golfers about to tee off. 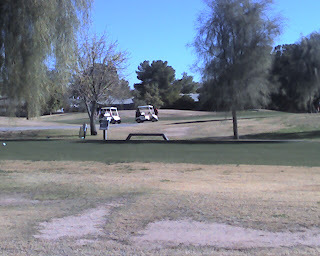 Otherwise I really like running along the course and watching the golfers. 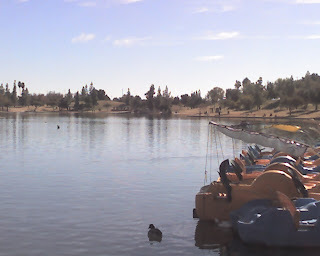 I got up to Kiwanis Park and ran around the lake. Lots of people enjoying the lake and park. My legs still felt pretty good at this time and i was making good time. Right around 12 minute miles for the first 8-9 miles. While passing the golf course for the second time it was time to head south to get back into Chandler. I get to run thru the tunnel of chain link fence. Good thing, I heard a golf ball hit a tree just on the other side as I ran by. 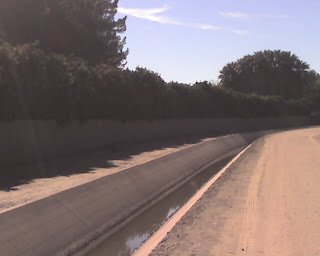 The canals have concrete sidewalks and dirt paths. I usually run on the dirt. This is around the 12 mile mark. I was getting a bit tired, but my legs felt a lot better at this point then they did last week. More canals get me further south. This was new territory for me. I was supposed to take a left in a subdivision to get to Kyrene Road, but didn't and ended up on the train tracks. It was less than a half mile to the next main road. 3 hours into the run and I pulled a Bill Clinton. No, not that. Remember I was wearing a sweat suit with stripes down the side. I looked like our old prez, but at least I was warm. I was getting hungry, it was lunch time and there was a McDonalds. Yep, I stopped in there. Downed a salt packet for good measure and ate a small cheeseburger. No, pictures of the burger. 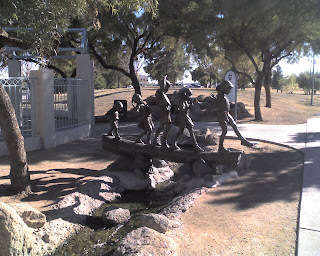 I ran thru Gila Springs, a nice subdivision in Chandler along the lake and creek, then eastward toward Desert Breeze Park. 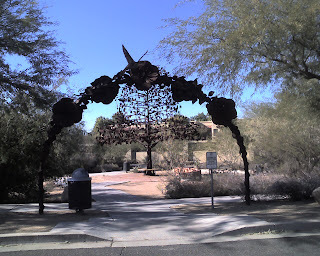 This is the entrance to the Hummingbird Habitat in the park. That's a really cool metal entry with a metal tree behind it. I'll have to get a better picture of it. I've never seen this entry, eventhought I've run past it before. I had about 3 miles to go before I got my 20 miles in. So, I ran around the lake and headed for home. This is a cool sculpture in the park. Kids walking on a log over a creek. At this point I was run/walking and just trying to get the full 20 miles in. No more pictures, I guess I was too tired. I made it home at 19.55 miles. I threw my outer top down on my SUV hood and continued to run around the block. There was no way I was going to stop before I got to 20 miles, even thought I was walking a lot. I ended up finishing 20 miles in 4 hours and 45 minutes. A pace of 14:17. I walked into the house to find all three of my family members sound asleep. I woke Amy, grabbed a shower and we were out the door on our way to Jerry and Diane's for their party. The food never tasted better. I should have taken a picture, but I was too busy eating. From time to time during this run, I thought about Chad. Chad is another runner here in the desert and he ran the Across the Years 24 hour race yesterday. Although he didn't do as well as he wanted to, he did great. 38 miles total before a leg injury ended his race. Check out his blog, he should have a race report up in the next day or two. It's now 5 1/2 hours after I finished and my feet still hurt. My legs feel good and my knees feel good. Can I do 26.2 miles on the 13th of January? I'm still not sure. My folks always give us cash for Christmas. So, today I bought some gu's and unnu for myself. Yeah, some people call it nuun - but read the label for yourself. I'll see if it works on my next long run. Then, maybe I can use it for the Rock and Roll Marathon coming up in 17 days. That's Chocolate Mint Gu. When we get freeze reports, people are told to cover up tender plants. Some people put styrofoam cups on top of their cactus. 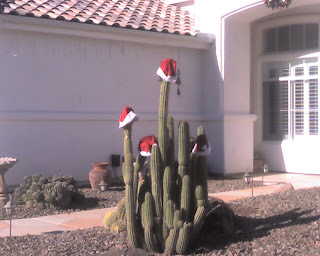 These folks put santa hats. Pretty cool, I think. 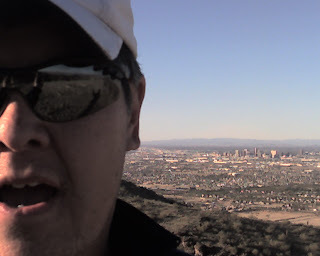 Mile 1171, Phoenix, AZ - Yesterday I went with my family and we hiked a desert trail in South Mountain. It was great, but we didn't get to hike very far. Today, I went back and ran the trail. 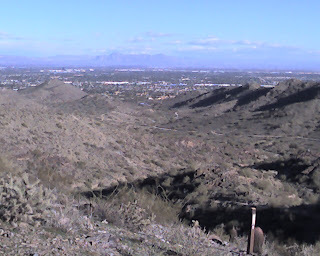 South Mountain is the largest urban park in the US. That's downtown Phoenix off in the distance. The National Trail runs the length of the mountain for 14 miles. I ran a bit of it today. Lots of mountain bikers doing crazy things on this mountain. 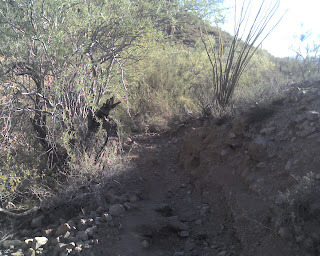 The trail is very rocky and narrow. For about a mile of it all I could do was hike. You can see in the photo below the valley I could run in, but then I had to climb the mountain. Here's a photo of my father in law - Harry Potter with my wife (his daughter) Amy. He actually looks more like Dumbledore. More on the run in a bit. 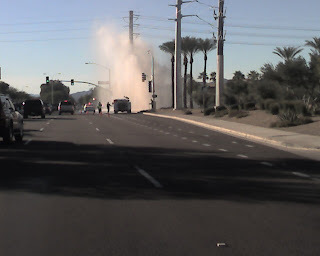 As I was leaving my neighborhood I got to see a water main erupt. Pretty cool. I got to drive thru the downpour. Must be due to our freezing temps. 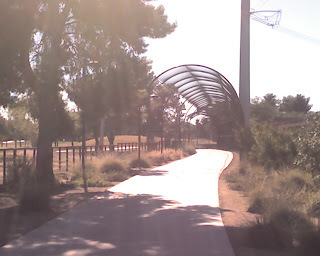 Google earth view of the trail. It starts off as a service road. Wide and slightly uphill. Still rocky, so you have to watch your footing. Enough of a hill, that I felt it a bit. After about 1.25 miles, you get to the base of the mountain. This picture makes it look like your on top and the trail is wide open. But, it's not. Lots of boulders and it's pretty steep. It was beautiful and you feel like your far from the city. It was slow going, as you can see by my splits below. But, on the return, it's all downhill. You do a lot of breaking on boulders make lots of twists and turns till you get in the valley. Then I was able to cruise all the way back to the parking lot. It was a fantastic run. 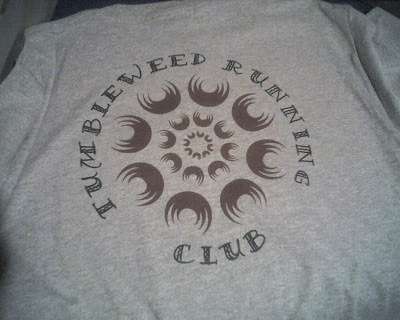 I hope to run it again next week and go further, much further. 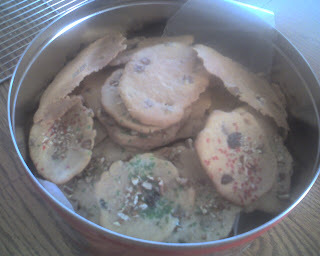 Today my family made my Grandma's Mince Meat Cookies. They taste unbelievable and it is a great way to remember my grandma. Of course this recipe reminds me of alot of my Monahan relatives. My brother and sisters. My mom and dad. My aunts and uncles. So once again, I'd like to offer this recipe to you, my faithful readers. To all of you that celebrate Christmas, have a wonderful Christmas day and cherish every moment you have with your loved one's. To those that celebrate other holidays, I also wish that you get to spend great amounts of time with the one's you love and that everyone finds peace and joy in the new year. 2008 - The Year of The Grand Canyon! 2007 closes with me reaching 800 miles for the year and nearly 1200 since August of 2006 when I started running. Over 24 races and 6 half marathons done. So, what does 2008 hold for me. Here's my dreams for next year. 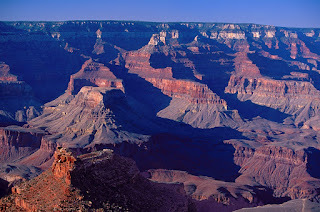 dream is to hike (not run) from the south rim of the Grand Canyon to the Colorado River some 4600 feet below. Spend the night and hike back out the next day. If you haven't been to the Grand Canyon, it is awe inspiring. It's is huge. It is deep. It is full of color and those colors change as the sun changes. It is GRAND! I have lived in Arizona for 12 years now and I have been to the canyon, once. Yes, just once many years ago. It is over 4 hours away, so I should be going there a couple times every year. However, life gets in the way. This I hope to change. My plans are to visit the canyon and do a hike on the Bright Angel Trail down to Indian Garden camp ground, 4.6 miles down the trail. Spend the night and hike out. 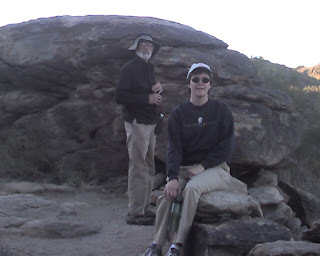 Then, plan for the rim to river hike at a later in 2008.
dream is to run a marathon. 26.2 miles. I'll have my first shot at this on January 13th, 2008. Yes, in a few short weeks. It's the Rock N' Roll Marathon in Phoenix. I know I can do a half marathon. I know I can do 20 miles. I'm not sure I can do 26.2 miles. I have one final long run before this race. I might have to rethink running the full, if I don't have a great tune up run in a few days. If it's not to be in January, my other options are to run the San Diego Rock N' Roll marathon in June or to run a fall marathon like the Tucson Marathon. dream is to run 7 half marathons. Yes, one more than I ran in 2007. This should be easy to accomplish if my schedule allows. dream is to run in more states. I think I will get the chance to run in Virginia and North Carolina later in the summer. Utah and New Mexico are not that far away. I have 5 states now. 7-9 states by the end of the year would be great. dream is to start running in Arizona State Parks. I've wanted to run in all the state parks, but haven't started yet. I'd like to get 2-4 of them done this year. dream is to run in over 20 races in 2008. My lifetime goal is to run in 1000 races. I need to get as many races done every year. Afterall, 20 races a year means I have to run races until I'm 96. I'd like that. dream is to run over 1000 miles for the year. My lifetime goal is to run 30,000 miles. That's 30 years of 1000 miles per. I guess I should have started sooner. I do have a Wish List for life time goals. If you have dreams or goals written down, I'd love to hear about them. Here's hoping we can all achieve our goals, dreams and aspirations for 2008 and beyond. Merry Christmas, Happy Holidays and Peace. Mile 1162, Mesa, AZ - Today was a trail run day. Yesterday I did an easy 3.1 miles in the neighborhood, but today I went out to Usery Mountain Park with my father in law, Harry Potter. No, not that one. He hiked up the Wind Cave Trail and I ran the Pass Mountain trail. You can click on the map below to see my route. The trail is very rocky and you are constantly running in and out of washes. So, the going is slow for someone that doesn't have a lot of trail experience. I'd rather go slow and not visit the dentist afterwards. I got a feeling you can do face plants into boulders pretty easily. 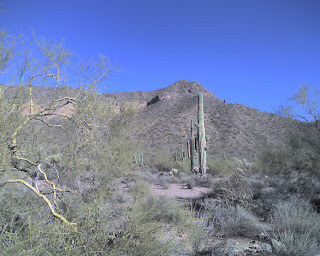 This is Usery Mountain. At the top you can see a shady area. That is where the wind cave is. I haven't been up there yet. But, some day. Today I decided to run around the mountain. Here's a good shot of what the trail looks like. Some parts where flat and smooth, but lots of the trail looked like this. Not ideal for running. 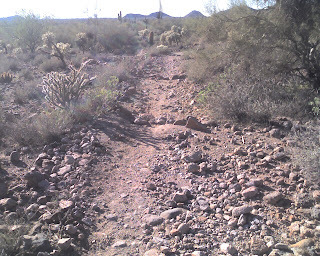 This is a view of the trail coming out of a wash. It's Arizona, so there wasn't water in any of the washes. You just run down in to them and back out. The deeper washes had mini switchbacks to get in and out of them. 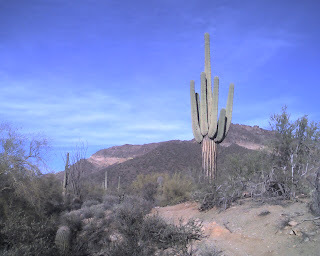 I love Saguaro's. 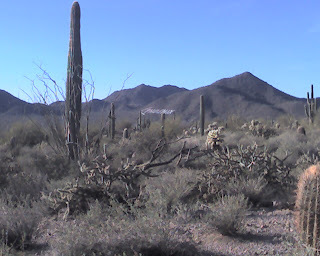 This park is a virtual saguaro forest. The mountain has a ribbon of rock across it. You can see the ribbon in the picture above. I used to know the story about it. You can learn more about the park at there website. 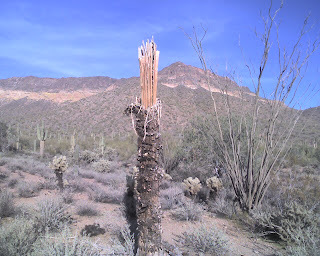 Some saguaro's don't make it. Here's one with the ribs exposed. If you've ever flown into Phoenix from the east, you may have seen the sign pointing the way. Here it is on the mountain side. Click the photo for a better view. Made of rocks, it is very easy to see from an airplane. My run was a slow one, but I did get almost 3.5 miles in and I really loved the scenery. I hope to do more trail runs this coming year. 24 Days to Think About It. 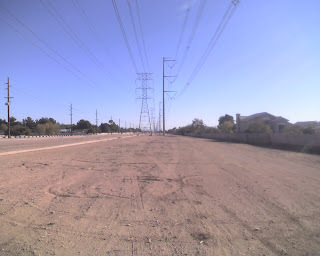 Mile 1155 Chandler, AZ - I ended up not running for two days. So, what do you do when you're that well rested? You do your long run and my long run was supposed to be 20 miles. It was supposed to be my longest run. My last long run before my first marathon. Wednesday morning came and it was cold. Ok, it was near 40 degrees, cold for AZ. I could run at any time in the day, so I decided to start late morning. I wanted to run in shorts and a tee, not in sweats and a parka. Around 11:30 am I hit the streets. My plan was to run north from my home on surface streets to the canal. West to the golf course. 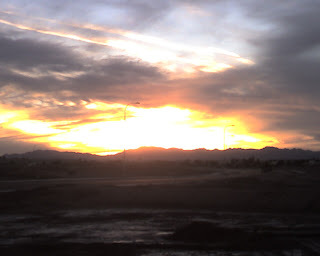 North from their to The Arizona Mills Mall. 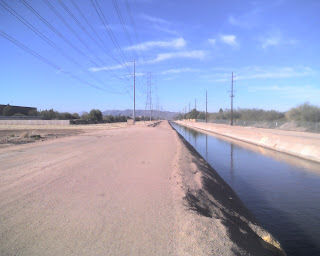 Then back track past the golfers, south on the other canal back into Chandler. Weave in and out of various neighborhoods and until 20 miles later I end up back at my front door. Damn plans. The first 8-9 miles were great. My legs felt great. My lungs and heart felt great. I was trying to keep my pace around 12 minutes and I was a couple minutes up each time I checked. I would do the math every mile. "4 miles x 12 is 48. Garmin says 46, good keep running." I would then do the percentage of running done thing. "Ok, 4 miles done. That's 1/5 of the total run. 20% done. Ok, 10 miles done, that's 50% of the run. Keep running." As I was around 10 or 11 miles I started slowing down. I was doing 14 minute miles. Way too much walking. I was running past the golf course, when an angel appeared. I hooked up with her and ran about a quarter mile talking marathons. I told her I was running the Rock and Roll Marathon, my first and she told me she's running the marathon in Austin. I had a scheduled water stop at the clubhouse, so I wished her well and she ran east. I was running south anyway. I'm sure I would have been walking at that point, if it were not for her. I got my water and started going south. At this point my legs started hurting. 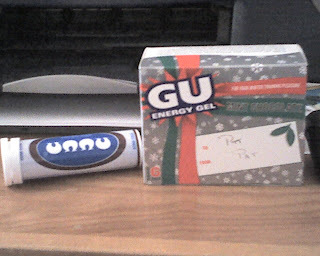 I had consumed three gu's and had water the whole way, but I felt like maybe I needed some energy. Maybe some salt. I knew a mile and a half away was a gas station. If I could just make it their I could get some salt, a candy bar and some gatorade. I did, but it wasn't to be for my legs. The last 6 miles I ran were brutal. I wanted to run. My lungs and heart rate were fine. My legs, midsection and hips were killing me. I ended up walking 95% of the time. When I got to Ray Road and the choice was to head further south or go directly east toward home, I choose the shortest route to home. My phone rang and I hoped it was my wife. I would have accepted a ride. It was work. So, I walked and talked for a bit. I got to an Arby's and thought if I could sit for a bit and eat something salty, then I could finish my run. A small roast beef sandwich and fries later (about 20 minutes later) I headed for home. I did speak with Amy on the phone, but declined a ride. I figured I was going to walk it in. I needed the time on my feet. And that's what I did. The last 2 miles. A total of just over 17 miles. A bit over 4 hours. Not counting my lunch time break. It was the most brutal run I've ever had. Could I have done anything differently? Any advice would be appreciated. Today, my legs feel much better. I will take the day off and run tomorrow. I'm glad I got the 17 miles in yesterday. I'm sure it will make me stronger. But, can I run a marathon in just 24 days? I really don't think I can. I know I can go further in a race, with cheering crowds. But, could I do 20 miles, let alone 26.2? I don't want to do a 7 hour marathon. Not even a six hour marathon. I don't want to walk the last 5-7 miles, like yesterday. I want to run 80% of my first marathon, not 50%. I don't want to DNF. What should I do? A picture from my run. While I was suffering on my long run, others in the TRC were having a blast in Disneyland. Yeah, you know who I'm talking about. I hope you're having a blast. What a great final. Contestants lost from 30-50% of their body weight and many of them looked absolutely fabulous. The twins took home all the money. Jim, who was eliminated early, lost over 51% of his weight and took home $100,000. His twin brother, Bill was the last man standing and lost 49.1% of his body weight. He won $250,000. Thank you to all that played. It was the first ever fantasy league for Biggest Loser and it was learning on the fly. I'd love your feedback on how you would change the competition for next year. I think the final four getting so many months to lose more weight kind of gave me an unexpected advantage. Hat's off to Bob and Jeff. There teams did fabulous and they picked great players. I may never stay in a hotel again. Watch this video of how they clean those glasses in your room from Devine Caroline. And I'm not big on using plastic cups needlessly either. Does anyone have a travel size dishwasher? I guess I could boil water in the coffee pot and then clean my own glasses. Mile 1138, Chandler, AZ - What a fun day today. Click on the map below. 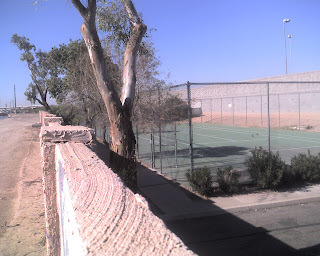 That's Desert Breeze Park. I ran thru my neighborhood and got to the park around the 2 mile mark. On weekends the minature train and merry go round are running and there's lots of families with little kids having a good time. 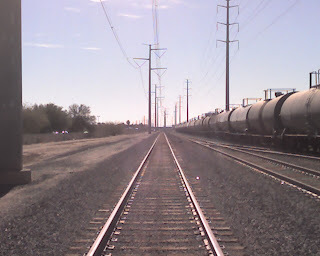 Today it was around 60 degrees and I got to see the train coming toward me. I always wanted to follow the train, so I did. I took a quick picture and followed it. You can see on the aerial photo the loop around the tennis courts. 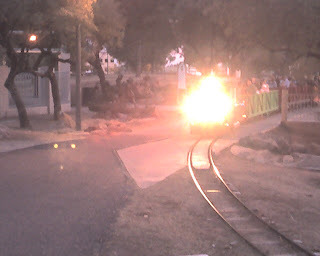 That's the path of the train. The sun was just setting and I got this shot. In all I ran 5.5 miles in a little over an hour. Some walk breaks, but garmin told me I ran 91% of the time. In my neighborhood I got to take some more Holiday photos. 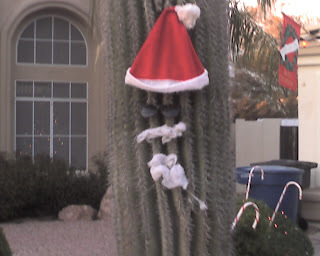 Here's a Saguaro (SA-War-o) with a Santa face. 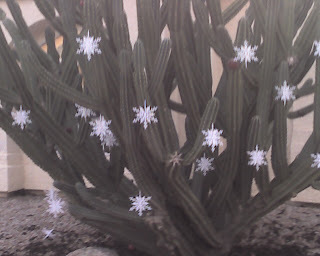 This cactus had snowflakes on it. Earlier in the day I showed homes to two different families. This is the view from a condo in Scottsdale. In the distance is Camelback Mountain. 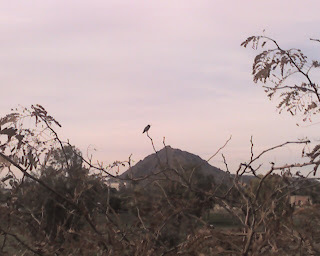 But, on a branch just to the left of the peak is a Hummingbird. There was a cat in the branches about 10 feet below. Now, if you don't think this was a great day for a run, read the reports from Lisa and Karen. Same city, same day. Obrat (Dan) and I are neck and neck in career mileage. Both of us are trying to reach milestones before the end of the year. Me - 800 miles for the year. Obrats - 1000 miles. Go visit Obrat's blog and cheer him on. I got five miles done after our office holiday party. Unlike Pokey's office party at a swank Scottsdale club, we had a potluck at the office. The food was really good, the desserts fantastic and the other party goers were incredible. I was in a room full of REALTORS and no one tried to sell me a house. I did win a $50 gift card for Circle K and Amy, my wife won a candle thingy. Anyway, back to the run. 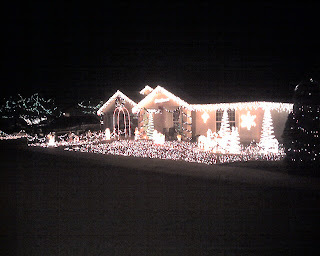 Better than last night and I got to take some pictures of Christmas Lights. 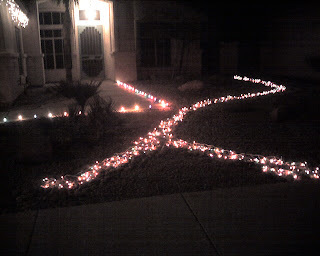 We do a lot of ground cover lights in AZ. We have fake creeks running thru our granite yards, so we like to make it look like water is flowing. It's great when the lights blink like the water is moving. This house was amazing. Lots of lights. Lots of blinking. This house is . . .different. 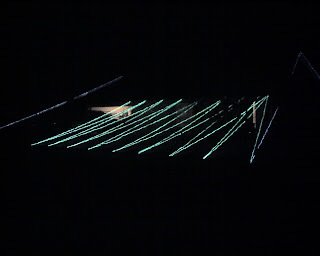 It had these strands of green light running from the roof line to the front edge of the lawn. The nicest thing that happened was I got to pass a group of kids and they started singing Jingle Bells just for me. I ran thru the middle of them and high fived 4-5 of the kids. A not so nice thing - I got chased by two dogs. One I knew was friendly. One I wasn't sure, but he turned tail as soon as I stopped and yelled. Real Estate side note: Our broker spoke at the office party. He said that our company has 5,000 closing so far this year. Seems like a lot, right? We have more agents in AZ than any other real estate company. About 1800 agents. That means that on average each agent has sold 2.78 homes this year. Luckily, Amy and I are doing ok.
And finally a high school prank. How do you think they did it? I got this from Phoenix 411, a blog about what's going on in our city. Oh yeah - the picture from the library in an earlier post - things they find in returned books. 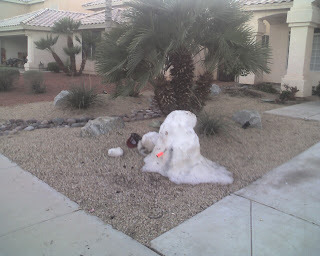 We make snowmen in Arizona. This one is in my neighborhood. I wish I could have gotten a picture of it yesterday or the day before. It was much taller. About 2 hours north of Phoenix, up in the mountains we get snow. We have a few ski resorts too. Often times, people with pick up trucks bring some snow back to the valley for a little fun. What do you think this is? 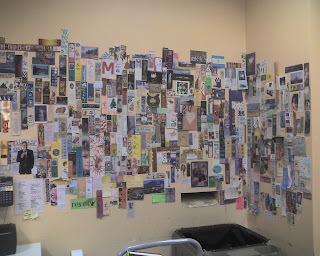 Hint - it's at the Chandler Public Library. 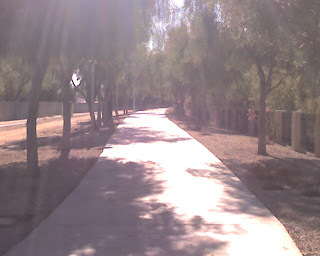 Mile 1128, Chandler, AZ - I got in a 4 miler today around the neighborhood. It wasn't fast, it wasn't all running. But, it was a run and that's good. I wanted to clear up reports that my name is on the Mitchell Report. As I went from being in my 30's to being 46 today I noticed injuries lingered longer and that my athletic ability was declining. I wanted to compete with the best in the world and knew that supplements would enable me to do so. As you can see I have set many personal records in running distances from 5k's up to the half marathon and recently improved my HM time by over 10 minutes. So, do I regret taking these supplements. Not on your life. They have made all the difference and I will continue to consume them for the betterment of my running career. For the record I will continue to drink Gatorade in all flavors, Gu and gel's in most flavors and those little chocolate squares my wife gives me for calcium or something. I, also, consider all things made at Dairy Queen as performance enhancing in nature and I will continue to frequent DQ. For more reactions to my being named in the Mitchell Report please refer to ESPN. News Release: I was not named in the Mitchell Report . . . never mind. 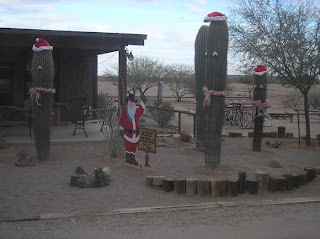 Mile 1124, Mesa, AZ -My wife had a quilt guild Holiday party and my daughter had a youth group meeting at church. I had to get some running in. It was overcast and colddddd. About 47 degrees. So, time to tape Biggest Loser, take my daughter to her meeting and run in Dobson Ranch. I told my daughter to call me if the meeting was going to finish early. I figured I had about an hour to get a good run in. I headed south along the lake and around two miles I decided to start heading back, but I was going to go a new route. One I knew. Then I got the call. My daughter telling me the meeting was over. I told her I was a mile and a half away and I would be there shortly. I gave her my car keys before I left, just in case this happened. She's 14. I figured she could wait in the car. Listen to tunes. She got in and got bored. Made shadow puppets on the car ceiling. Read the owners manual and used it to make up celebrity kid names (I'm not sure either). Then tried to turn the radio on, which set off the security system. She had to get the youth leader to help her turn it off. The youth leader was still surprised that Emily was there. She waited with Emily. Back on the run, I decided to take a short cut. This isn't good when there's a lake in the way. If you look at the map, you'll see in the circle the loop I took that didn't get me anywhere. I started near Guadalupe Road and then ended up back there when I thought I was a mile north. I called Emily to say it would be a bit longer. I had my Treo that has mapping software in it. I used it a bit, but it's not real clear and the lake got in the way. And it started raining. It's amazing how I can be on a major road that I've driven on a million times and not know north from south. I was confused and wanted to get back to the church. I guess I should have said a prayer at this time, but being a guy I didn't want to ask for directions, not even from him. I got pretty disoriented, but I knew that Guadalupe ran west/east and if I ran one way I would either get to Dobson or the 101 and then I could go north. But, I wanted to find the short way, not the easy way. As you can see it took me over 5 miles to get back and over an hour anyway. If Emily didn't call me I would have gotten back around the same time anyway. Oh well. It was a good run and made a little more exciting because I was worried that I was keeping Becky, the youth leader there waiting for me. I knew she wouldn't leave Emily alone. I thought about calling my wife. I knew her party was ending around the same time and she could go over and wait with Emily. I found out when we got home, that Amy's party was in Dobson Ranch and I ran right past it. I finally got home and Emily had a good time telling her mom about her adventures with my Honda Pilot. I then got to watch the Biggest Loser. I really am getting into this show. I like all the contestants. So here's what we know. Isabeau, Bill, Hollie and Julie (all Black team members) are in the finals. I have Isabeau and Bill on my fantasy team. Neil is gone. Which hurts the fantasy teams lead by Bob and Jeff. Bob has a 26 pound lead on me and I'm the only one that can catch him. We both have Isabeau, so she's cancelled out. I have Bill and Bob doesn't have anyone else. The finals are next week, but I believe there's a four week spread between this weeks weigh in and next weeks. It was taped up until next week. The four finalists had to go home and lose weight on their own for the final four weeks. Then they weigh in. If Bill can lose 6.5 pounds per week, which would get him down to 178, then Bob and my fantasy teams would tie. If Bill loses more, I win. If he loses less, Bob wins. Can Bill lose the 26 pounds? Make your predictions here. Now, who's going to be the Biggest Loser on the show? So far Isabeau and Hollie have lost 24% of there body weight. Bill has lost 36%. Julie has lost 23%. I think Bill has a pretty good shot at it. Now Neil being eliminated this week is a blessing in disguise for him. The eliminated player who has lost the most weight gets $100,000. Neil has a great shot at that. If he was in the final four, hew would have been behind Bill at 32% of body weight lost. So, I predict that Bill will win the Biggest Loser prize of $250,000 and Neil will edge out Kae to win the $100,000. Please let me take this time to thank you. It was a wonderful day for a race. The skies were overcast, but not a drop of rain fell during your half marathon. The volunteers on the course were friendly. We had plenty of water, GU2O and assorted GU flavors. 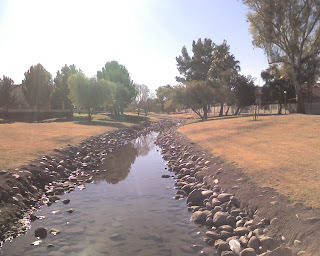 The course was flat for the most part and Scottsdale always has plenty of sites to see. My race went well too. The first few miles I ran with my Earlham College sweatshirt. Around mile 3 I dropped it off in the bushes along Scottsdale road. I hoped to pick it up later, but it was gone. If you have a lost and found and it's there, please let me know. If I never see it again, that's ok - it needed to be replaced anyway. I ran along side two women at the start of the race. They passed me and were about 10 yards ahead until around mile 5. I passed them, they passed me, I passed them and so forth throughout the entire race. Around mile 7 I passed a guy that had a garmin that would beep every 30 feet or so. I would think it was my garmin, so I would check my wrist every time his garmin beeped. I got tired of the HR beep alert and the distance beep alert on my garmin a long time ago, so mine only beeps on the mile. I had to distance myself from him so I didn't have to hear his. But, of course, he and I would leap frog each other for miles. I passed one lady, she must have weighed 90 lbs and she was walking. I asked how it was going and she said she was hurtin' a bit. I told her to hang in there. A couple miles later, she passed me by. Here's a picture. It looks like a sky cake with a wedge cut out. 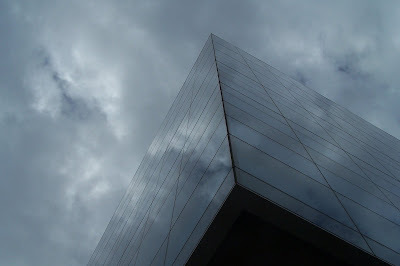 But, it's really a building with the Arizona sky above. We've been cloudy alot lately. My first mile was done in 9:54. I knew this wasn't going to last. I wanted to do as many 11 minute miles as I could. So, I got in to a good groove of doing 10:50 splits while I was running. My walking added to the time. As you can see, my splits slowly creaped up. But, for the most part I ran well. The last two times I ran I had a sharp pain in my left knee. Runner's knee. I was afraid that I wouldn't be able to run today and would end up not finishing. I used my knee strap that I had bought months ago and it worked great. I did not have a single knee issue the entire day. 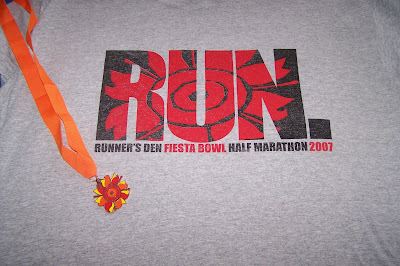 I loved this race because they gave out finisher's medals and the coolest tee. This is the race associated with the football bowl game. The football players may get better swag (I think they get a Wii), but I love my medal and tee. But, the neatest thing about this race is that I set a PERSONAL RECORD for a half marathon. I ran this one in about 2:27:41. My previous PR was 2:37:21 at the Casa Grande half back in October. That's about 10 minutes faster. After the race, I ate an apple, went to the john and headed back out onto the course. I wanted to get another 5 miles in. I ran the course backwards and got to see and encourage the extreme back of the packers. I ran out about 2 miles, saw the last runner with the sweep cyclist and saw the volunteers taken the course down. I ended up having to wait at street signals, so I turned around, caught up with the last runner and ran in with them. I almost got an extra four miles in. My legs were dead. Check out the map below. We covered a lot of Scottsdale in one big loop. When I was adding extra miles on, a cop pointed out that I was running the wrong way. It was a loop course with the start and finish near each other, but I told the cop I parked near the start and needed to go back. About 10 seconds later a confused cop yelled, "I thought the start was near the finish?" Again, I'd like to thank you Ms. Race Director and all the volunteers of this years Fiesta Bowl Half Marathon.